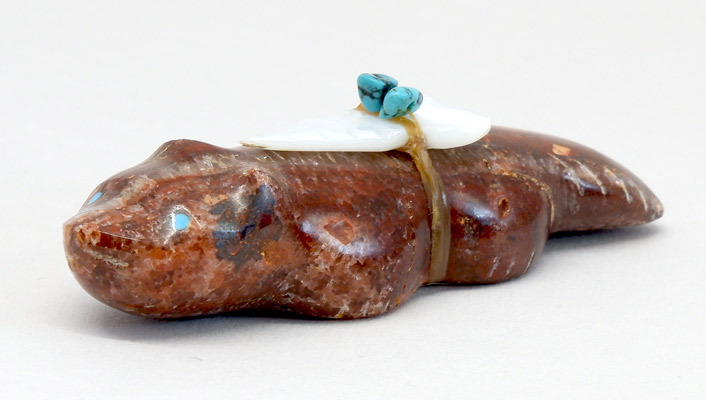 Zuni artist Leland Boone has carved this badger from red onyx and inlaid turquoise for its eyes. 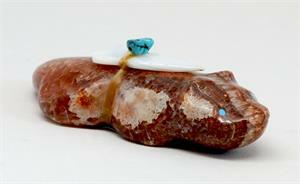 A shell arrowhead bundle with turquoise is wrapped around the badger. Fetish carvings are made in numerous styles and materials and are representative of a vast array of animals and figures since artists and carvers have become more creative and varied. 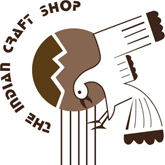 Carving fetishes has developed into one of the most collectible art forms of the Zuni Tribe today. Fetishes are still made and used in homes, for special purposes and religious ceremony. They originally came from the belief that when a stone resembled a certain animal, the power of that animal resided in the stone. Sometimes after finding such a stone, carving a bit of the stone to bring out more of the animal resemblance was done. Height: 0.75", Length: 3.25", Width: 1.25"